It is an extended use convertible car seat that can be used from infant way past 40 pounds as most convertible seats end, all the way to belt positioning booster seat so it could truly be the last car seat you will need. I believe there is value in having an infant car seat for newborns and infants but after your child is too big for the infant seat this is the model you should look at. With a nice wide seat, the padding makes it comfortable and it is well made and sturdy. When your child grows you slide the 4 position padded headrest and harness up without needing to un-thread and re-thread the straps, if you have ever had to do that you will know how awesome it is to have a seat smart enough to not need to be re-threaded. I noticed my son had grown and I was able to move the headrest up while it was still securely strapped in my car! I occasionally have to remove and install this seat in a grandparents car and it is made to be easy to install with the latch system. The belts have a locking button that you need to push the button to release the latch belt slide to make them easy to install and remove when you need to. Once it is tightly installed it does not loosen up at all even on my leather seats, that thing is absolutely immobile. Even with it being taken in and out of my car countless times for cleaning my car or moving it into another car it is still as sturdy and tight as it was when it was brand new. When my son is not in the car my daughter wants to ride in his seat because it is more comfortable than her seat. 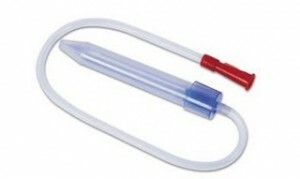 It is easily adjustable with a front adjustment to accommodate my older daughter while still being latched into my car. It has nice long shoulder belts so you can comfortably strap your children in with snowsuits and puffy jackets. My daughter is about 40 pounds and with her winter coat there is still plenty of slack in the shoulder straps to accommodate even larger children to be strapped into the 5 point harness. 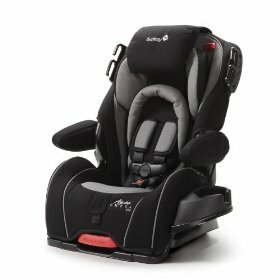 The American Academy of Pediatrics recommendations and keep your child rear facing for as long as is possible for the car seat and this seat allows you to have your child to stay rear facing up to 35 pounds. This seat has plenty of room and can comfortably stay in reverse to keep your children safe. In comparison to more expensive safe seats that can be kept in rear facing for up to 35 pounds this seat is really reasonably priced. I love this seat! It looks cool in my car, (I bought it in Proton) it wipes clean easily with the material. It will grow with my child, it is large and comfortable and has features that older kids want like the articulating arm rests and the removable cup holder. I am excited that it will still be latched into my car and can be used as a belt positioning booster when my children outgrow the 5 point harness. I wish I would have bought two when I got it, one for each kid. I was fortunate to get the Euro-Pro Shark S3501 Deluxe Steam Pocket Mop for Christmas. I wanted to use it for a few weeks before I wrote a review to make sure I was not still in the honeymoon phase and so I could be honest as possible. The reason I wanted a steam mop was because I wanted to eliminate cleaning with chemicals on my floors. I had been using vinegar and hot water and a microfiber washable mop head that I washed after each use. I did not like the fact that I had to empty my bucket after each room I cleaned so I was not using dirty water on my next room floor. Even though I felt my floors were visibly clean, they were wet for 20-30 minutes after mopping and I did not think they were sanitized and certainly did not smell fresh, heck vinegar does not smell fresh, it smells like vinegar, but I would rather use that than any other chemical cleaning product. When I opened it for Christmas I could not wait to get home to try it out! Unfortunately, I had to put away the truckload of gifts that the kids received and put away the Christmas decorations so I could have an clear floor to clean. We have hardwood floors in the kitchen, living room, in two bedrooms, tile floors in bathrooms and the entryway, carpet in the basement family room and one bedroom along with plenty of area rugs to warm up the wood floors. I swept and vacuumed the rugs then was ready to get to work with the steam mop. I read the instructions, filled up the reservoir to the top, plugged it in and pumped the steam and started mopping. I used the rectangle head and the white pocket pad and was amazed at the steam, it started strong and stayed strong the whole time I cleaned the floor. The steam cleaned my floors and got the corners cleaned, I loved how the head pivoted so easily, I loved that when one side got dirty I flipped the mop over and cleaned with the other side of the pad, I actually used one side for each room. I tried out the triangle head for corners and small spaces but I felt I had no problem getting into the corner with the rectangle head in case you don’t want to switch heads. cord is at least 5 feet shorter so a longer cord does make my cleaning faster and easier. The coolest option on this steam mop is the carpet glider for carpet freshening and deodorizing. 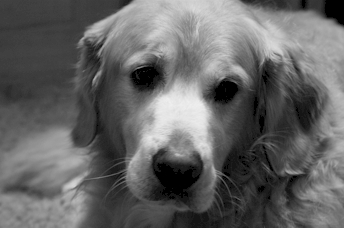 We have a large golden retriever that is not always the best smelling dog, he swims and rolls in dirt and does all the other gross hunting dog things. With all of the area rugs in my house I simply drag the steaming purple dusting pad across the rug till I cover the entire area, it makes my carpets smell great, I don’t like to think that my kids that enjoy sitting on the floor to play and watch TV sitting on a stinky carpet. I can smell the difference immediately after they have been steamed and they are dried in minutes, I know the kids are playing on fresh area rugs. Today I tackled an even bigger job than my hard floors, the basement carpet! You are not supposed to get carpets wet because it will break down the carpet fibers and shortens the life of the carpet which is why many people get their carpets professionally steam cleaned instead of shampooing them, so I figured this is steam, I have to try it. The dog likes to sleep on the basement carpet and when I was doing push-ups with Gilad the other day I could certainly smell the dog. I took the carpet glider out of the box put on a fresh white pocket pad and fired up the steam. I steamed the whole carpet twice, when it was wet on the first run I could certainly smell wet dog, I flipped the head over and saw the dingy side that had swept over my whole carpet and started on the other side. After the 2nd pass the carpet looked like it woke up, it looked lighter and brighter. I put the fan on the carpet to make sure any remaining steam was dried, and then I went down into push up position to get a close up whiff, and seriously the carpets did not stink, I had my nose across the fibers and felt success that my kids could sit on that carpet without smelling that it is my dogs favorite resting place. I read multiple reviews by other people who put chemicals in the water reservoir. Why? The point is to have chemical free cleaning and people are adding Febreeze or Lysol into the steam, now you are not only putting those chemicals on your floors but it is also getting into your air with the steam. If you are buying this steam mop to reduce chemicals in your home don’t put them into your water reservoir! Honestly you do not need chemicals to make your house smell good, this steam mop makes your house smell fresh. Now that I have expressed how happy I am with the Shark Steam Pocket Mop I want to compare it to the other steam mops. The Bissell 1867 Steam Mop Bare Floor Steam Cleaner only has one sided steam pad, it has a swivel head but it is a very thick head which some people who review it complain makes it difficult to get under tight places, it also does not come with the carpet glider. 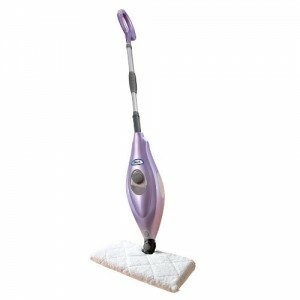 The H20 Steam Cleaner Mop appears to come with a carpet glider and it has the triangle head but it does not come with the large steam head for large areas or the long cord. The Euro-Pro S3202 Shark Deluxe Steam Mop is the smaller unit without the extend-able handle, the triangle head, the steam pocket, or the swivel head. I would recommend to pass up these three models and invest in the Euro-Pro Shark Steam Pocket Mop , it has all of the good features of these other three steam mops and tops them with more inventive features and attachments. I am happy I have the Shark Steam Pocket Mop. I am enjoying mopping, I love that my floors are clean, disinfected and completely chemical free. Huggies Overnites: No more wet mornings! Wow, Huggies Overnites Diapers are amazing! I just changed my little guy’s diaper after sleeping for 11 and 1/2 hours and he did not leak through his diaper! I was so happy, I did a little dance! His skin was completely dry, not clammy and not cold. His pajamas did not get wet, his sheet, blanket and snuggle blanket did not need to be washed this morning for the first time in a week. All night long he slept quietly and comfortably, because he did not get cold like he usually does from his full, wet diaper after 11 hours. The Huggies Overnites Diapers feels just like a Huggies Snug & Dry Huggies Diapers , I was trying to figure out how something so thin was going to work all night long. The package advertises no leaks and extra absorbency and they delivered. When I took the Huggies Overnites diaper off my son, I touched his belly which has been clammy and cold normally, and his skin was totally dry and warm, how wonderful it must have been for him to sleep and not feel cold all night. Normally his morning diaper is completely full and feels like it could explode at any minute, when I folded up the overnight diaper it felt firm and not mushy. I have been hesitating because of the price increase from regular Huggies Snug & Dry diapers, I figure if I can keep him dry, comfortable and sleeping all night long and not having to change his crib sheets every morning the extra few pennies per night is well worth it! If you are having any problems with your child leaking through their diaper at night, and waking up to a clammy and cold with wet crib sheets, try the Huggies Overnites diaper.